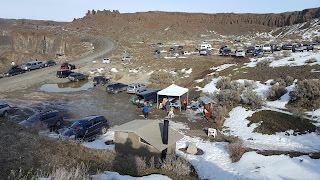 On February 25 & 26 HPP Members Pia Blake, Emma Sherwood, Adam Woods, myself Graeme Rennie, and a crew of our GVOC friends descended to central Washington State for a two day middle-long combo at the famous climbing area Frenchman Coulee state park. The 'Desert Run' is a lightweight home-brew style orienteering event that was very high on my list of favourite events from last year. Last year the Sunday terrain had been completely new to me and the weather had been perfect and hot. Though this year wasn't quite the same conditions (0˚ instead of 20˚) it still did not disappoint. There is a good group of friendly faces (with enough high level competition), some great courses, and some new and different challenges. What more could you want? The 'Arena' on Saturday - Hardly any snow! Saturday was a gorgeous, cold day. The Elites ran a 5.2km middle that started with some excellent technical orienteering amongst some cliffs then transitioned to some more open legs towards the end. I really enjoyed this race as it is a type of terrain that I am quite unfamiliar with and posed some new challenges. And unfortunately Emma Sherwood had to bow out half way due to injuries. Day 2 was a different story - There was a couple centimetres of fresh snow covering everything and snow fell the whole time. The Elites ran an 11km long. 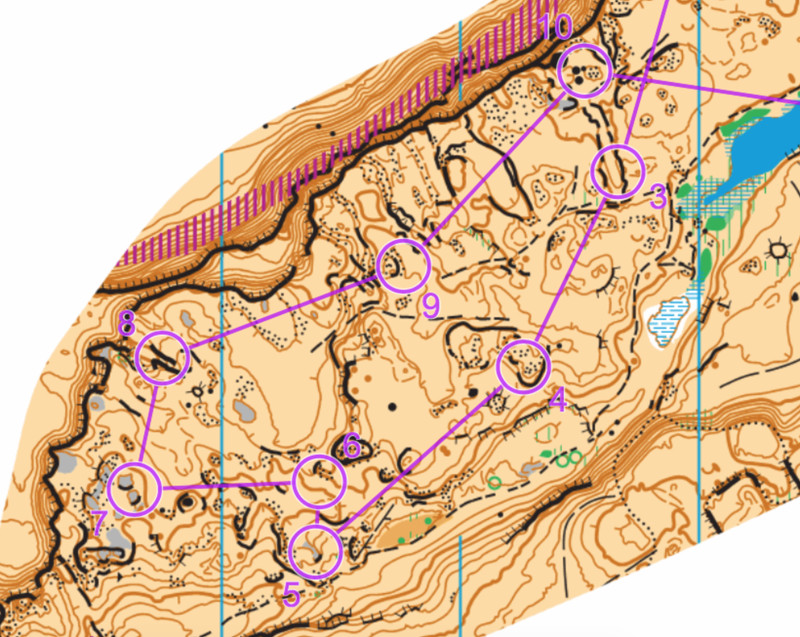 The most challenging part of the course for most people was a long leg from 8-9 across a large area of bland desert slope shown below. (2.5 m contours, 1:15 map). The bonus difficulty here was a thick fog that reduced vision to only 10-20 meters maybe. Crossing the nothingness in the snow and fog only to arrive at rows of identical seeming cliff features was a real challenge and my compass work was not up to snuff. 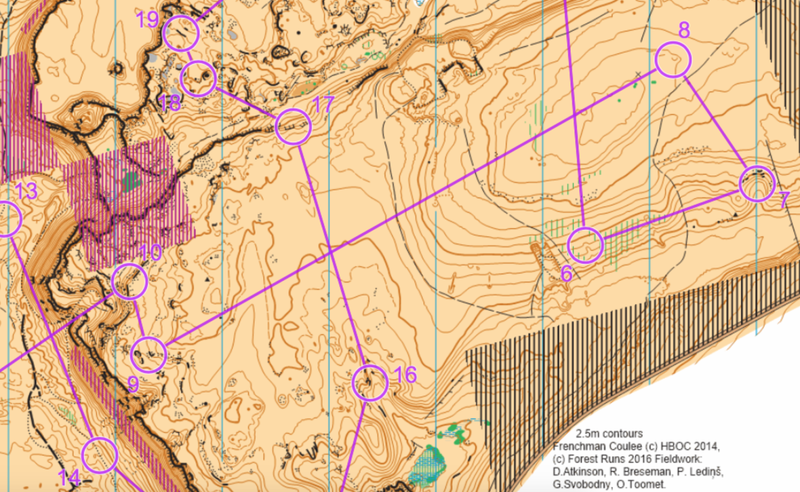 If you want to see some of the large mistakes that were made checkout the route gadget links below. Emma Sherwood went out for a bit of a score-O - to experience the snow I imagine. I had been quite sick and a long slog in soft sand in the cold was a tough day for me but regardless I came back grinning and excited. 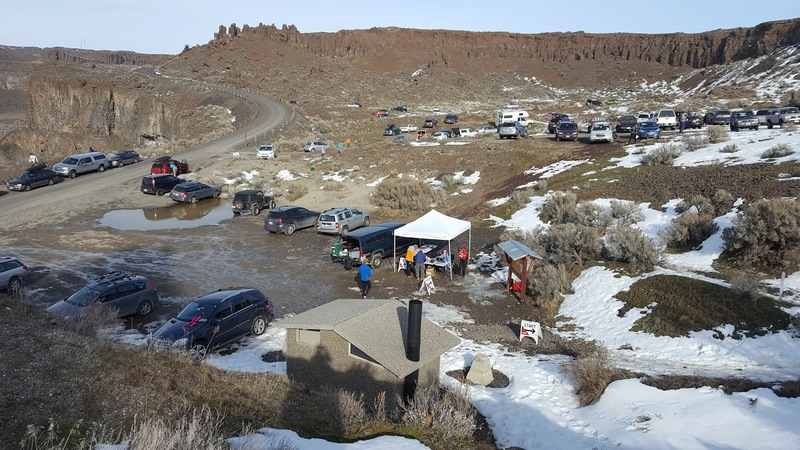 This race included a excellent ~60m descent (after #10 in the above photo) in soft desert sand, some excellent views, and a very cool river grotto. And despite my less than excellent run it was a truly enjoyable adventure - These are the ones where I remember why I orienteer.